Many thanks to Tina Wood, Occupational Therapist at Therapy In Motion, for this great example of how Talking Mats can be used to explore thoughts and feelings both in present-day and in retrospect, to evidence positive outcomes from a change in educational placement. Tina’s use of colour coding and pie charts really helps to illustrate this. Tina attended our Talking Mats Foundation training back in September 2016 and since then she has been using Talking Mats regularly in her work as an Independent Occupational Therapist. 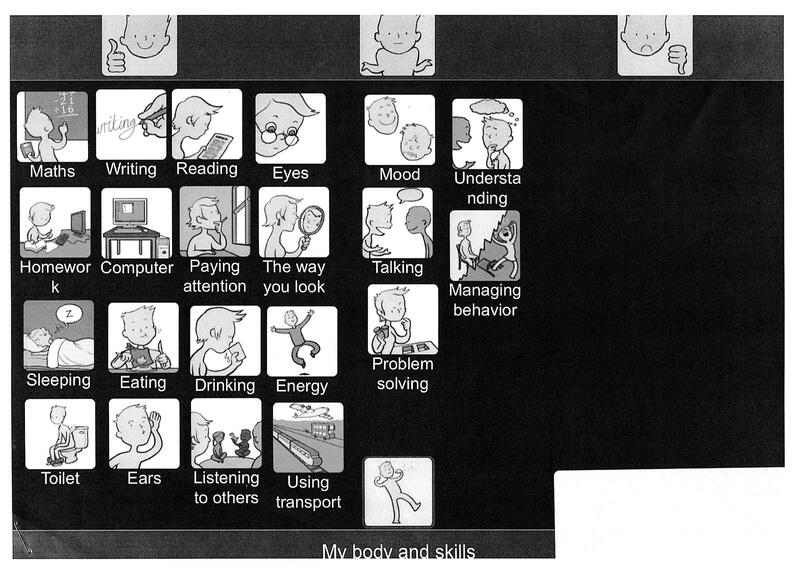 In this example, Tina has used Talking Mats to enable Ben (name changed for anonymity, age 12½ years) to share his thoughts and feelings using the Talking Mats ‘Consulting Children and Young People’ resource packs – focusing on the topics ‘My Body and Skills’ and ‘What I do and Support’. 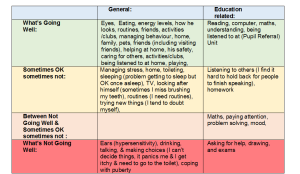 At the time of this Talking Mat, Ben had been accessing a new placement at a Pupil Referral Unit for the past 11 months (click on the picture below to see a clearer version). 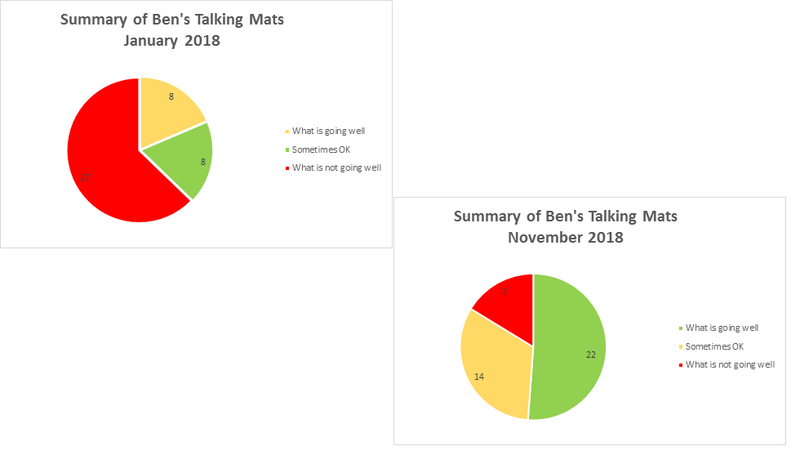 As there was clearly a difference in how Ben felt things were going when he was attending his previous school, Tina decided to ask him to do a retrospective Talking Mat of how things were going for him 11 months ago in January 2018, when he started to feel “unwell”. 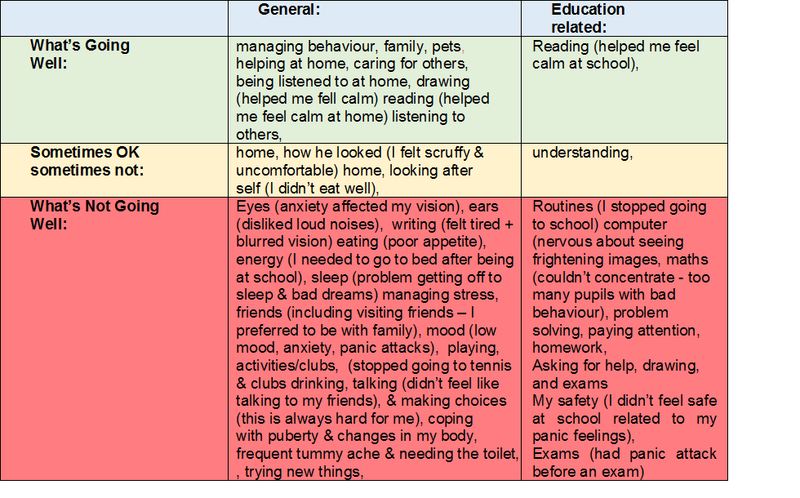 This enabled comparison with how he feels now in the “safe setting” of the Pupil Referral unit (click on picture to see a clearer version). 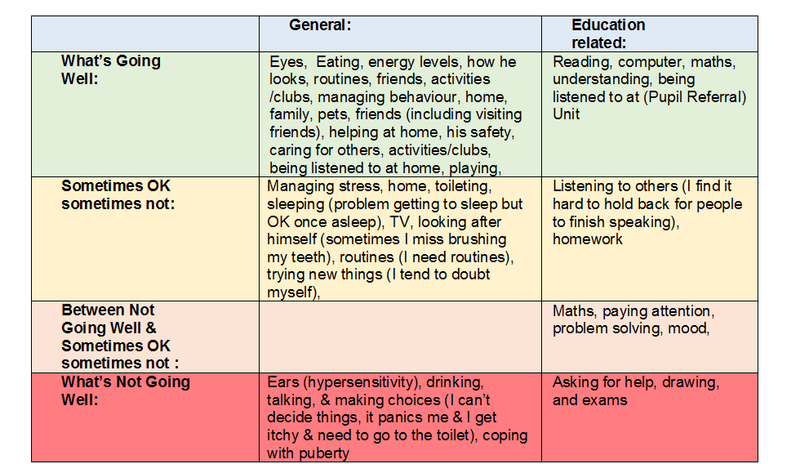 As can be seen from these charts, there had been a huge change in Ben’s perception of how he is coping with life in general and school in particular. 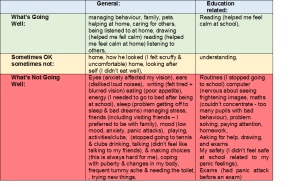 Tina recommended that this information needs to be considered along with the rest of Ben’s sensory needs (as reported in her full OT report) when deciding on what is the best educational setting for him after leaving the pupil referral unit. We love this use of colour coding and pie charts to illustrate the information from Ben’s Talking Mats – to really ensure that Ben’s feelings and thoughts are seen and heard. This entry was posted in Children and young people, Communication difficulties, Criminal justice, ehcp, ICF, Learning disability, Mental Health, Occupational therapy, Participation, person centred approach, Personalisation, Training and tagged Children, Communication difficulties, EHC plans, empowerment, justice, Learning Disability, Mental Health, occupational therapy, Participation, person centred, Personalisation, Talking Mats, Training, Young people on April 12, 2019 by Lois Cameron. Talking Mats is a useful tool to help parents see their child’s point of view. The stage for each parent when their child also has an opinion about what is best for them can come as a surprise and is sometimes challenging. For parents of children with disabilities it can be even more so. This story is an example of how Talking Mats helped parents hear their own child’s voice amongst the background noise of the voices from health, education social and voluntary services. David was in his final year of primary school. He attended a small village school and was transitioning to a large mainstream secondary. He has mobility problems due to cerebral palsy and uses a wheelchair. He can walk very short distances with effort using a walker and in his primary school used this method to move around the classroom and go to the hall for lunch and PE. This was a functional way to meet 2 of his targets : changing position and walking practise. His parents wanted this to continue when he transitioned to secondary school, although the health professionals involved felt it was going to be too difficult given the greater distances in the new building. An electric wheelchair was proposed for this new context. David’s parents were finding this next step challenging. One of the professionals involved wanted to find out what David felt was important in his new school and used Talking Mats as a way of supporting him to think about various factors. The top scale used was ‘important/ not sure/ not important’. David’s mat clearly showed that what was important to him in his new school was being with his friends. When his parents saw his mat they realised that this would be impossible if he was to move from class to class using his walker and it helped them make the transition to seeing him in an electric wheelchair. It also helped them see things from David’s point of view. They were more than happy to fit walking practise into a different part of his busy day because they had heard what was important to him. Talking Mats allows different voices to be seen and heard.The name has been changed to protect identity. Laura Holmes was pleased to meet up with Rachel Clemow, Head Teacher and Donna Wood, Education Support Worker who work for the Virtual Schools Team in Wigan to find out about the impact of Talking Mats training. 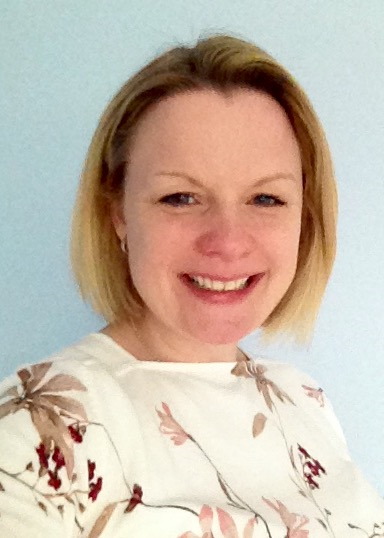 Donna accessed a Talking Mats Training last year delivered by a Talking Mats accredited Trainer in Wigan Educational Psychology service and quickly put her training into practice with the children that she works with, using the Consulting Children and Young People – Primary resource pack. Other members of the team soon recognised the potential benefits of introducing this approach themselves, and so, in April 2017, a further 15 members of the Virtual Schools Team received Talking Mats training. Looked After Children can often struggle to express their thoughts and feelings, often as a result of their situation/ circumstances. This can be further compounded if they also present with speech, language and communication difficulties. There is a higher risk of such difficulties within the LAC population (Cross 1999 ). Often there are many professionals involved with a Looked After Child, all asking a wide variety of questions, some of which can be highly personal and/or emotive in nature. The team have observed that children will sometimes end up giving answers which they think the listener wants to hear, rather than answers which reflect their true feelings/views – or the child may withdraw from the process entirely. Consequently, it can be very difficult to ensure that the true ‘voice of the child’ is being heard. Sometimes the children themselves struggle to understand what their own feelings are – often the topics and questions can be complex and involve abstract concepts. – Enables the listener to get to know a child quicker and more easily as there is no pressure/expectation of the ‘thinker’ – it is a child/’thinker’ led approach. – Provides way of supporting the child to open up to express their views and feelings, even if they have previously been hard to engage – and for the child to develop better insight into their own feelings. – Helps to avoid the possibility of adult/listener misinterpretation of what the child is trying to communicate. – Enables the child to focus on pictures – which appears to result in the child being more comfortable in expressing their own views and feelings – as opposed to what the child thinks the listener wants to hear. – Provides a holistic view of the child – which can support target setting and planning at key stages for that child, for example, transition to High School. – Gives the child something they can be successful at – there are no ‘wrong’ answers. 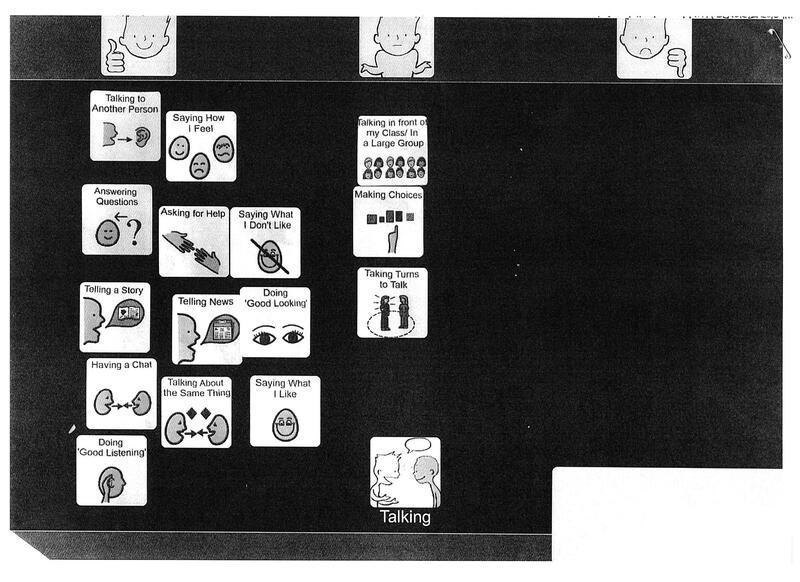 Donna shared a great example of how Talking Mats helped a young girl to describe an issue at home which she had not shared with any carers or school staff previously. The child placed the ‘home’ option symbol on the ‘not happy’ section of the mat then began to whisper to Donna explaining the reason why. This resulted in Donna being able to share the information with school staff and social care, consequently, the issue was resolved. Services, organisations and schools in Wigan are already using the Talking Mats approach as a result of widespread training delivered by our Accredited trainers in the Educational Psychology Team. This provides a great example of how using Talking Mats across agencies can really help a whole area to become more child/ young person led. The Virtual Schools team are now recommending the Talking Mats approach to other agencies working with the Looked After Children on their caseloads, such as adoption and fostering services. If want to access the training then there are Talking Mats foundation courses run regularly in London, Stirling , Manchester and Newcastle . Once you have attended a foundation training and gained experience you can apply to become an accredited trainer . This entry was posted in Blog, Children and young people, Communication difficulties, ehcp, Impact evaluation, Participation, Training and tagged Accredited training, Children, Communication difficulties, Participation, Personalisation, Talking Mats, Teens, Young people on June 27, 2017 by Margo Mackay. Thanks to Laura Holmes for telling us more about the innovative work in Stockport. As part of an ongoing project, we at NHS Stockport Children’s Speech and Language Therapy Service are introducing the Talking Mats approach to support the children we work with to contribute to their own EHC Planning, enabling them to make their voices heard. Whilst completing the mat the child volunteered further information about particular options – in general I find I get to know the children I work with much quicker using this approach! Once complete, we agreed that we would sub-mat the option ‘talking’ (which had been placed under ‘unsure’) and explore that option as a topic in our next therapy session. I then thought about all the possible options I wanted to explore in this submat, and created symbols using Boardmaker. I was able to add these symbols as options for the digital mat by taking photos using my Ipad and selecting them from my camera roll. The mat enabled R to pinpoint the areas of talking she feels unsure about – i.e. 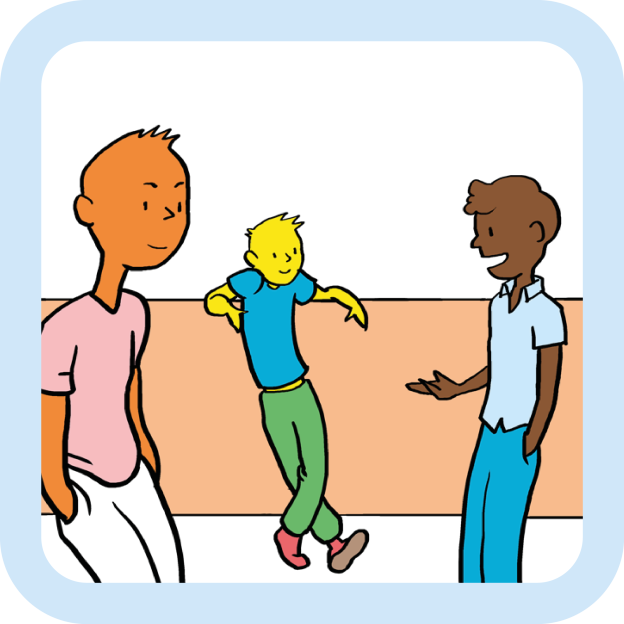 ‘talking in front of my class/ in a large group’; ‘making choices’; ‘taking turns to talk’. I was then able to include this information in my review report, attaching the pictures of the mats as evidence of consultation. My review report included details of specific targets and recommendations to support R to work on the areas she had identified, which are designed to be incorporated into her EHC Plan. This entry was posted in Blog, Children and young people, ehcp, Participation on June 20, 2016 by Margo Mackay. It is great to have Laura working with us to build on some of the excellent work being done already in the North West. Two examples of best practice are in Wigan where Talking Mats are used to increase child participation and more recently in Salford. Children’s services in Salford NHS foundation trust are committed to seeking the views of children and young people about how they feel about their health appointments. They have finished piloting their own Talking Mats set and the revised set has just been sent to the printers – it looks great. We are running a training course in Liverpool on the 21st April and we would love to meet more of you from the North West. This entry was posted in Blog, Children and young people, ehcp, Event, Participation and tagged EHC plans, Young people on March 30, 2016 by Margo Mackay.